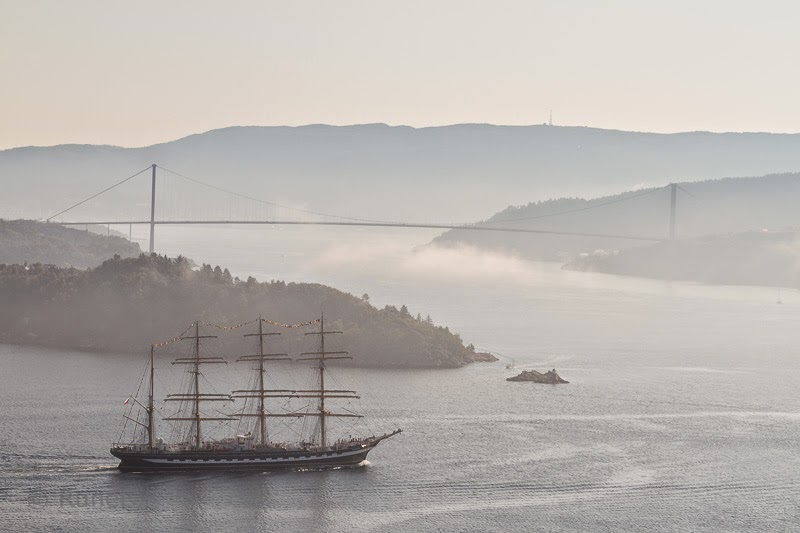 Bergen is one of the host cities for Tall Ships Races 2014. Our part of the arrangement is officially starting tomorrow, but this morning I spotted the Russian four masted bark "Kruzenshtern" coming in through a bit of lifting morning fog. It is the largest of the participating ships. Lovely..I like the romance of sailing ships.. This "Tall Ship" fits perfectly into this scene. These tall ships are beautiful objects. I do love the tall ships and this one does indeed fit the scene! Great, foggy capture, Rune! Good to see you back online! Hope your week is going well!! Beautiful image! I saw the preview on Petra's blog roll and wanted to see it all. Staselig skip i flotte omgivelser! Nice to see the tall ships again! And nice to see you posting again! Love tall ships; several years ago, we had a chance to go on a day cruise on one ... it was a lovely experience. This is an amazing photograph. I love it!